Chad Stahelski and David Leitch’s directorial debut (the founders of the 87Eleven stunt collective) is one of the best action films of recent times. They land the audience in an established criminal underworld with minimal histrionics and a superb lightness of touch. The film cleverly hints at a wider premise than the cat-and-mouse device provided, and despite its simplicity, the film is executed with a great wit and meticulous sense of style. Their distinguished careers as fight choreographers and stuntmen informs every nuanced frame in this beautifully made film: equally indebted to the gun fu of John Woo, the brutality of The Raid and the moody palette of The Matrix (for which Stahelski performed as Keanu Reeves’ stunt double). Levity punctuates even the most visceral of sequences, and distinctly cinematic traditions are interrupted by the mundane: a punishing fight scene with Adrianne Palicki’s tough female assassin is disturbed by a telephone call; in another sequence, a lethal take-down of an entire task force culminates in an innocuous chat with a police officer. 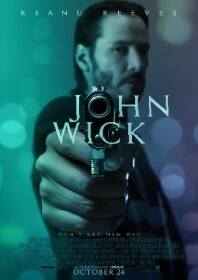 Even the motivation for the newly-widowed assassin John Wick (Keanu Reeves) to come out of retirement is oddly endearing: his murderous vendetta is sparked when Russian hoods break into his home and kill his dog. Reeves is at his potent best in this kind of role: conflicted and self-destructive, he handles stoicism just as well as the physical stuff, and his age helps in assuming the role of a wizened killer returned. Even the Russian mafia are scared shitless when they learn the legendary John Wick is after them. “He’s not the bogeyman,” says Michael Nyqvist’s kingpin, “he’s the man you send to kill the bogeyman.” And all of this over a dog. Brilliant. A beautiful film…John Wick is flawless on every level. This is Keanu Reeves at his best. Keanu was born to play John Wick. You find yourself cheering on John in his journey to reclaim what was rightfully his. The carfu and gunfu are top notch. I love the softer side of this story as well….the love story between John and his wife is touching to say the least…and let’s not forget that adorable little pup, who crawled her way over to John to be by his side, as she slipped away. I’m not going to lie, that scene brought tears to my eyes. My heart ached for John in that moment…so beautifully played by equally as beautiful, Keanu Reeves….a truly gifted illuminated being and artist. Thank you for this film. I look forward to the sequel.